How many times have you come home to find water in your basement? The truth is 98% of U.S. basements will incur some type of water damage (Source: blog.waterdamagedefense.com) during their lifespans. Water follows the path of least resistance, finding cracks and holes through basement walls. Flooding can often be attributed to insufficient drainage around basement walls, heavy rains, a faulty sump pump, or a combination of these factors. There are a lot of ways you can incur basement water damage, so here are some things you can do to help prevent and tackle basement water damage. Move all electrical outlets or plugs to higher levels in the basement. Do not store valuable items in a basement with potential flooding issues. The ground next to your foundation should slope away from the home. Point gutters and downspouts to discharge water at least 5 feet away from the home. Plant plants and borders at least 12 inches away from the foundation. Seal all windows and vents. 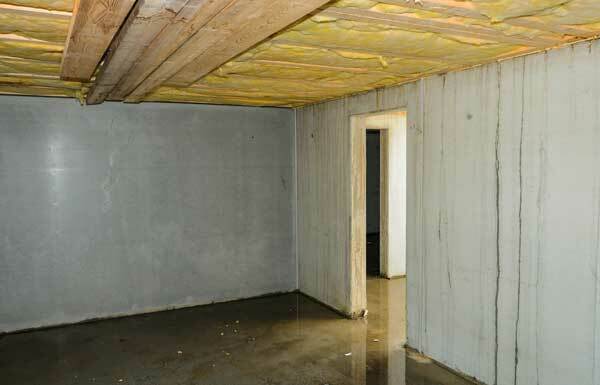 Waterproof the walls inside your basement with a roll-on concrete waterproofing product. Consider installing a sump-pump to pump out unwanted standing water. Address poorly-draining soil around the home by installing a French drain. Call a foundation contractor to address ongoing and outstanding issues with your foundation. Call a restoration company for emergency water damage extraction. What are the long-term issues with flood-damaged basements? Basements that experience regular flooding will expose homeowners to mold and mildew, which can lead to eye irritation, sneezing, nasal stuffiness and skin irritation. Mold has been linked to allergies, asthma and respiratory issues. Regular water damage to the foundation of your home can contribute to structural weakness. There are obvious costs to dealing with a flooded basement and no homeowner wants to clean up a flood multiple times. The overall value of your home can also be negatively affected by a flood. Allergens alone can contribute to as much as a 15% decline of a home’s value according to MSN Real Estate, and not disclose water damage to your home to a potential buyer can be detrimental to the sale of your home. If you need basement water damage extraction, First Restoration Services has certified water damage cleanup technicians on call 24/7 for immediate response 365 days a year. Check out our WATER DAMAGE page to more about our water cleanup services.